One survey found Shanghai schools to be the best in the world. But not every school plays by the same rules. Ever since it topped the 2009 Program for International Student Assessment (PISA) rankings, Shanghai schools have been the envy of the world. Last week, I visited Shanghai to get a sense of how it’s educating the world’s smartest 15 year-olds. I found all the school principals I met with to be dedicated, their schools well-funded, their students disciplined, and their teachers responsible (teachers only teach nine hours a week, but use the rest of their workday to prepare for class, mark homework, attend training workshops, and tutor their failing students). In other words, I found Shanghai’s schools to be like Shanghai itself: organized and efficient. But I also discovered that while seemingly open and progressive, Shanghai schools are burdened by an impossible mission: They have to educate high-performing test-takers who are happy and creative. 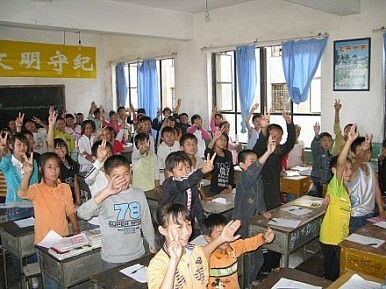 Shanghai education officials know that the stress on tests is killing children’s curiosity and creativity, and so they decree that elementary school children must have an hour of sports and not more than half an hour of homework each day, and that schools must not stream students and must not have weekend classes. But principals will be promoted based on test scores. Only the top 60 percent of Shanghai students can go on to high schools. Starting in grade six, there are district-wide examinations each year for four years, culminating in the high school entrance examination (the zhongkao). That means starting in sixth grade, each student and each school is ranked publicly. Those schools that are just not making the cut will either face a parent revolt or a student exodus. What’s more, the government, concerned with social opportunity, demands that all students reach a minimum score on the zhongkao (which forces schools to secretly stream students and secretly tutor those failing). These contradictions manifest themselves in Shanghai classrooms in tragi-comical ways. In the first primary school I visited, my host, Miss Zhang, told me she had to fight tooth and nail against teacher and parent opposition to ensure that her 600 students got 30 minutes of playtime in the morning and in the afternoon. Her school is one of the city’s “creative education” laboratories, and she showed me her digital classroom where students could design furniture and clothes. The classroom was equipped with a 3-D printer and a hologram projector, and there was another play classroom that displayed Transformers made of Lego parts. These rooms were neat and orderly, always with a teacher on hand to ensure that the kids were playing creatively in a neat and orderly manner. In the next elementary school I visited, the principal there, Mr. Zhang, waxed eloquently about his “sunshine education.” He had TVs positioned all around the school, blaring all day about how students shouldn’t do too much homework, or get stressed over tests. He showed me his digital classroom where his fourth-graders were coloring in pictures, as surveillance cameras monitored their every movement (one young boy who sat near one of the cameras stopped coloring, and sat transfixed by the large black eye that was staring back at him). In the next room, there were monitors that showed the children coloring. Mr. Zhang explained that the point of the surveillance technology was that teachers could monitor how full of sunshine the kids were at being able to color, without being disturbed. When we visited an empty classroom, I picked up one of the student backpacks, and commented how heavy it was for a second-grader. Mr. Zhang opened the backpack, saw the ten textbooks neatly packed inside, pulled out the pencil case, and started blaming the pencil case for making the bag so heavy: “When I was young, our pencil cases were so much lighter.” Then his assistant looked for a backpack that didn’t weigh twenty pounds. We couldn’t find one, and so Mr. Zhang explained to me that the issue was the classroom didn’t have lockers, and so the students were forced to use their backpacks as lockers – they don’t actually take the backpacks home.